My holiday spirit officially souled into overdrive while attending the launch party of PopCarts, a holiday shopping pop-up at The Grove featuring a trio of mini wagons carrying favorite wares from Heidi Merrick, Clare Vivier, and ban.do. During the holidays, The Grove is as North Pole as it gets with nightly snowflakes floating, Christmas trees shining, and Santa Claus ho-hoing. Little things like seeing a lit up Christmas tree still moves me and for that I am grateful. It's truly a blessing to experience rhythmic intervals of joy and elation triggered by life's everyday delights. I hope to move you with a fabulous holiday beauty giveaway! Dr. Harold Lancer, dermatologist to the stars has created, just in time for the holidays, The Lancer Method limited Edition Luxury Collection. 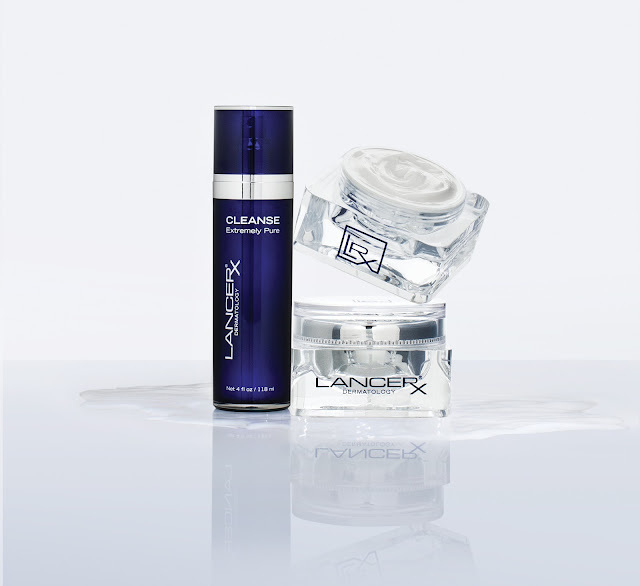 It's the best of the Lancer systematic skincare program re-packaged in incredible Lucite containers. These products are not only one of Oprah's Favorite Things but the beautiful containers themselves, jars imported from Italy, were actually approved by Oprah herself for this special gift set. I'm giving one away one gift set (value $300) to one lucky reader. 1. Leave a comment and tell me what moves you during the holidays. Include your email address. 2. Subscribe to my blog via Google Subscriber or Bloglovin'. It moves me to see my daughter get so excited about the holidays. She's 4 and she's really into the Christmas spirit this year! What moves me during the holidays is hearing and seeing people doing acts of kindness for strangers. It is a wonderful reminder that we are all in this together and could use a little help now & then. I'm following goodbadandfab on twitter. @moore30terri. @lancerskincare comes up as not found. Tweeted too! I liked goodbadandfab on Facebook. I like you on Facebook. Thank you! The kindness of strangers during the holidays is what moves me. What moves me is the kindness and spirit of everyone! What moves me is doing and seeing people do other things for others --- I just wish more we would all remember to do it year round and not just at the Holidays. what moves you during the holidays? - First of all, is that these days we are together with your family. I love the family atmosphere. On this day, we forget and forgive the evil. These are magical days. I love it. The holidays is a wonderful time of embracing and reflecting what we have in our lives. Giving thanks, giving love, and spreading the holiday joy. What moves me during the holidays are the lights and Christmas, also the delicious food! I like everything about Christmas, being with my family, the feelings, the happiness, shopping (lol) , cooking and just being in the festive mood. I follow @goodbadandfab on Twitter as @nicolecarter911 (Nicole Carter), couldn't find the other one.